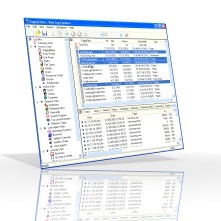 Web Log Explorer Lite is freeware log analyzer, fastest and most powerful an interactive, desktop-based log analyzer for Windows. This log web analyzer create "multilevel" and cross-linked reports on-the-fly. Simply right-click a row in any report, whether it's a page, a host, a user, a search engine or anything else and choose from a list of sub-reports available for this report item(s). For example, when you see a page views report, you can click a certain page name and see visitors who accessed this page on any day, or a list of referrers that led visitors to this page or in a page views report. You can select a certain page and get a list of its visitors, their paths across the site, countries and cities these visitors are from, referring sites, keywords that the visitors used in search engines to find this page and much more... Normally, all these reports are pre-built and statically linked. The comparison table below shows which features are available in different editions of Web Log Explorer.